So what's the secret to a lighter fettuccine alfredo? In this recipe, it starts with a roux made with butter, garlic, flour and low fat milk. Parmigiano-Reggiano is stirred in along with less fat cream cheese to create a smooth and silky cheese sauce. 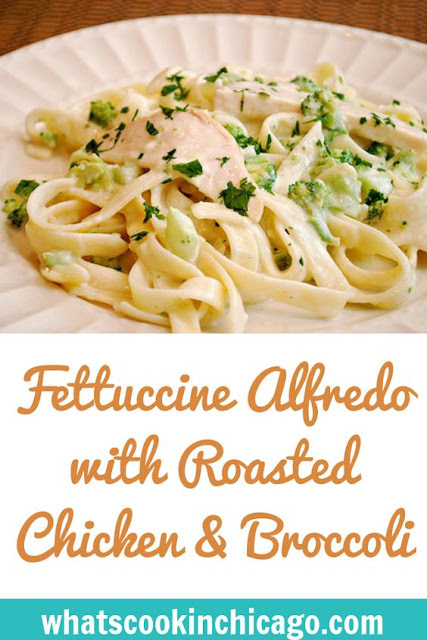 It's not as thick as the traditional alfredo but it still holds a lot of flavor. Being a bit thinner, the sauce is great to toss pasta with so everything is coated with this delicious cheese sauce. Melt butter with garlic in a medium saucepan over medium heat, cooking until garlic become fragrant. Whisk in the flour to create a roux and allow to cook for 30 seconds. Gradually add milk and continue whisking to combine. Cook the mixture for 5-7 minutes or until it thickens. Stir in 1 cup Parmigiano-Reggiano cheese, cream cheese, and salt, while continuing to whisk until mixture is a smooth consistency and cheese melts completely. 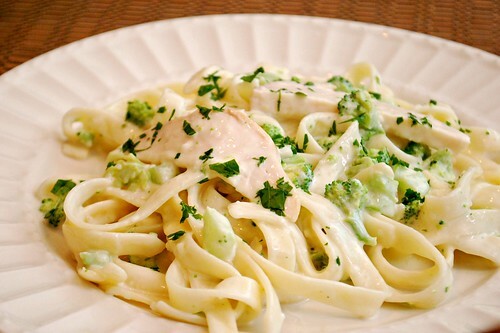 In a warm bowl, add hot pasta, sauce, roasted chicken and steamed broccoli. Toss to combine and coat. Plate servings and sprinkle with remaining 1/4 cup Parmigiano-Reggiano cheese and chopped parsley. Garnish with black pepper, if desired. Serve immediately.